We grew from about 1,700 members at the outbreak of war to approximately 180,000 by 1943. We served in up to 15 types of duty ranging from catering to meteorology, transport, telephony and telegraphy, codes and ciphers, Intelligence, Security and Operation Rooms. Members of the WAAF were among the 1,570 ground crew who lost their lives. 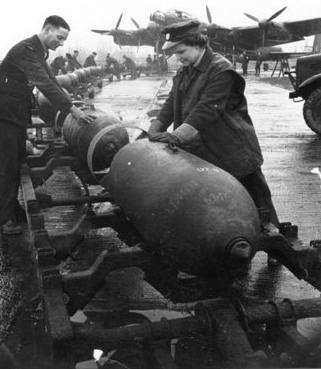 The WAAF re-formed into the WRAF in 1949, and fully integrated into the RAF in 1994. For more information please view the A WAAF Bibliography link on the left of your screen, in particular the books by Sqn Ldr Beryl Escott. See also the RAF Museum link on the left of your screen. The links below may be useful but no responsibility is taken for their content. Peggy Meek (the late Mrs Priestley) of 207 Squadron, photographed at RAF Langar for a US magazine.